I’ll start off by apologizing in advance for not communicating this to some of you before or keeping you in the dark after we started this process. The past 11 months have been HECTIC! In 2006 we had a crazy idea of selling our home and going sailing in the Caribbean for a year. Thankfully, that lofty goal didn’t work out. We would have sold everything we owned, except our boat, and only been able to manage a year of cruising. I’m sure it would have been a wonderful year but we didn’t have the right boat and a year of fun isn’t much to give up all our appreciating assets. The dream of sailing away has been with us ever since and in 2013 we decided it was time to find a boat that would safely and comfortably take us to the places we longed to go. That process is another story which is somewhere on this page, I’ll try to link to it another time. We also spent that time working on acquiring more appreciating assets (rental homes) so we could manage to go for much longer than a year, hopefully for 5. Our thoughts were that the best timing for such an adventure would be when our oldest was 10 and our youngest 8. We set a goal of casting off our dock lines in 2021 and after reading about many sailing families with younger children we moved it up a year to 2020. Fast forward to November 2017… our kids are now 7 & 5 and the time is slipping away too quickly. Combine that with a work schedule that is hard on family life (if you’ve tried to ever get together with us on a weekend you understand) and things came to a head. We decided to put the house on the market spring of 2018 and just go for it. The new plan was to leave in September 2018. Commence the whirlwind. Selling a 3,000 sq ft, on acreage (with barns and outbuildings), and after living there for 14 years is no easy feat. We hadn’t done a very good job at keeping possessions to a minimum and there was a ridiculous amount of stuff. After a crazy summer we succeeded at selling our home, 3 vehicles, a ski boat and a ton of belongings (and donated more than we liked) and were ready to start our adventure. Which meant it was time to move onto the boat and start the next chapter! EXCEPT a project we were having done to the boat wasn’t complete and we had nowhere to go. While in limbo of the boat getting put back together (which doesn’t mean that the project was complete) we decided to change plans once again. The new plan was to wait out the boat project (which by the way as of November 1 still isn’t complete), Dan would continue to work and retire at the end of the year, and the kids would enroll at the school we love, which allows us to home school part-time, and leave in June 2019. This allows us to accomplish a few more tasks on the boat, at a not neck breaking pace, and hopefully see more of friends and family. Apologies again for taking a year off in updating our page and keeping some of you out of the loop. We will be updating more and more now that things have finally settled. 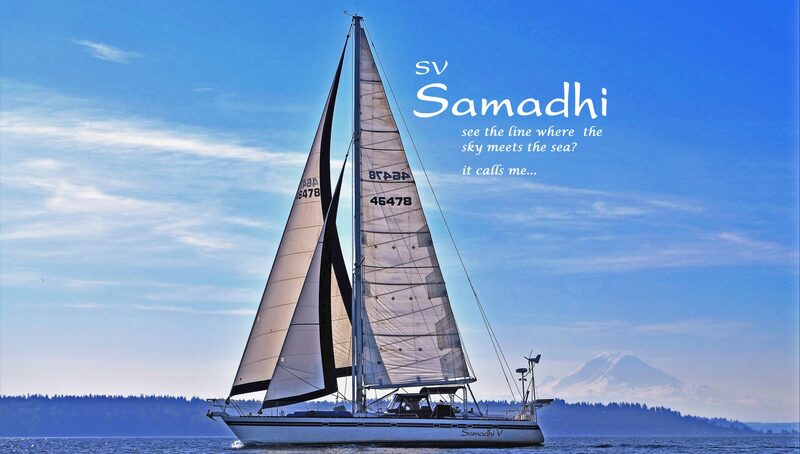 If you have any questions or would like to come see our “home” aka Samadhi V in Seattle let me know. Enjoy the transition to full time boat life as it was a bit of a test for me to look at every item from an apartment and question the usefulness when I moved onboard fulltime. Everything will work out and you’ll mark the days with watching another sunset slip past the horizon. Last year, getting ready to sail in the Pacific islands could’ve eaten up far more of the year than we expected, but we did the big jobs (like the rigging) and forgot about the non essential jobs. Like you, we realized the key to sustaining the adventure is building an asset base and we’re taking 10 years to do that and then we will be away again.